Do u think Prussia is the most Awesome character in Aph? de keuze van de fan: Yes! Of course! Should Prussia Become a country again? de keuze van de fan: Yes! Of course fool! Who does Prussia have a crush on? Should Prussia be with Hungary? de keuze van de fan: What? SHUT UP HE'S MINE!!!!!! What? SHUT UP HE&# 39; S MINE!!!!!! Oh right. The complimenten thing... Can someone answer this for props? Oh well. Hallo to everyone, this is PastaChick. I got my account banned but I am back. So who can tell me what I missed out on while I was gone? 0_o HOW IS IT POSSIBLE??? Italy: "Marukaite chikyuu, Marukaite chikyuu, Ma--"
Germany: " --u ore wa Doitsu! Ma--"
Japan: "-- Hyotto shite chikyuu, Nihon-"
France: "-- ore Furansu! Marukaite chikyu--"
America: "-- me mo suupaa saizu! Ame--"
England: "-- Hyotto shite chikyuu? Ore Igi--"
"Nanka sugee tanoshisou da na! Yoshi, ore mo iccho yatte mikka!" I am a Prussian, u know my colors? the point, it notes on my colors. I am a Prussian, wants to be a Prussian. ich bin ein Preuße, will ein Preuße sein. It was celebrated around the world. Why? Who did it affect? an answer was added to this question: Do You want Prussia to become a country again? 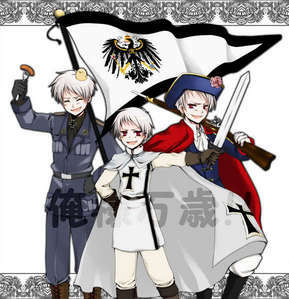 a comment was made to the poll: Is Prussia your favoriete APH character? a pop quiz question was toegevoegd: Which of these is not one of Prussia's quotes? How old is Prussia's human age?